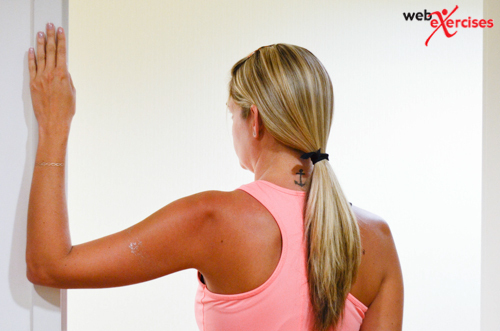 Purpose Correct shoulder imbalances and restore function. Benefits Increases flexibility, improves joint range of motion, and improves circulation. Standing, place one hand on the low back palm facing out. Place the other hand behind the head. Slowly move the hands towards each other until a stretch is felt or until fingers are able to interlock. 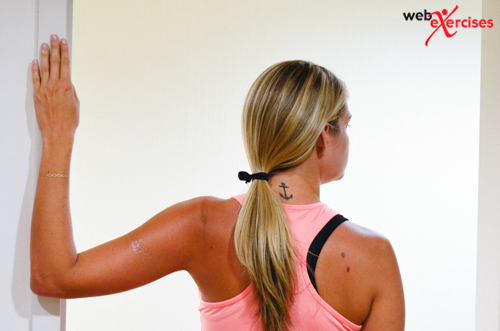 Place forearm on wall, or doorway, with elbow bent at 90º. Elbows should be slightly below shoulder level. While maintaining forearm contact, lean body into doorway until gentle stretch is felt in the chest and shoulder. Hold for 20-30 seconds or for recommended duration and repetitions. Begin by sitting upright in chair. Maintain good posture, positioning self on sit bones (ischial tuberosities). Spine is in neutral position with a flat lower back. Interlock fingers and place hands behind head. Elbows are in front of ears. While maintaining good upright posture, squeeze shoulder blades together as elbows swing outward. Pause and return to start position. Repeat for prescribed repetitions and sets.